Christmas snuck up on us this year but Lisa managed to pick up a copy of Red November and Dominion for me. I’m still working through the rule set for Red November but I can’t see how working together to help a bunch of drunken gnomes fix problems on a submarine where all kinds of horrible things are going wrong could be bad! I was very surprised at the size of the Dominion box. The box is as big as Mission: Red Planet but it strictly a card game. 500 cards yes…but still…why the big box? Well…it appears that either Santa made a mistake or he just realized how good of a person I really was over the last 12 months. In any case, another package arrived containing both Hamburgum but also Tempus. Yahoo!!!! Thanks BGG Secret Santa! Well…it looks like I’ve been caught being bad a few too many times. My BGG Secret Santa gift arrived a few days ago and I got Lumps, The Elf Coal Game. In an ultra-skinny box holding a single hex-fold board (two thirds the size of Railroad Tycoon), a rules booklet, and two decks of cards, Rails of Europe finally arrived. Anybody want to come over and play?! Players choose a role (Rail Baron) to play out of the two they are dealt at the beginning of the game. The baron card bears a hidden goal. The mountain hexes have been identified with a visible dot in addition to the graphical terrain. Operations cards no longer include Major Lines. Instead, the Major Line bonuses are available to everyone…first come first serve. The chart in the middle left of the board enumerates the Major Lines. Players may only issue shares when they are low on cash needed to make a purchase and they can only issue just enough shares to cover the shortfall. There are a few new Operations Cards: Passenger Line (first player to deliver 4 of the 6 goods colors), Capital Charter (awards points to connections to and from a capital city), City Charter (awards points for connections to and from a city and blocks the city from other player’s connections, Tunnel Engineer (one time use card making building track over mountains and ridges for half price). The geography is very mountainous and it looks like play will get expensive quickly and it looks like the terrain will drive players into competition sooner making for a more interesting game. I received an email today from GameSurplus informing me that my order had shipped. I initially thought, “what order is that?” My Secret Santa gift had already shipped off to my BGG Target so what could it possibly…hold on a minute. Hold on just a cotton pickin’ minute! Back in April I’d ordered several backordered games and after a couple of months of waiting I’d moved in-stock games off of the order and had them sent. On numerous occasions I thought of canceling the order but I really wanted the games. Well, my horse came in and my copies of Galaxy Trucker (which has been in stock for a while now) and the real trouble maker Rails of Europe are making there way to Columbus. Yahoo!!!! 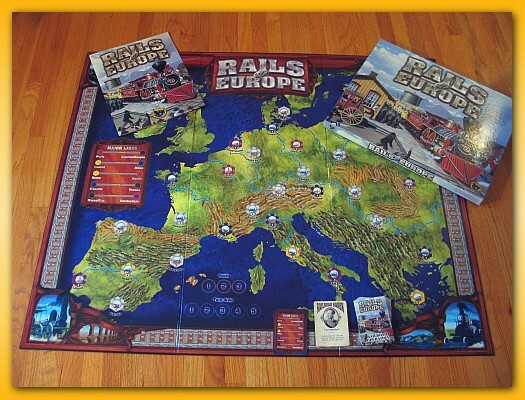 I honestly thought with the revamp of the “Railroad Tycoon” line that the reprint of Rails of Europe would be scrapped but wouldn’t you know it…I’m going to get a copy. It’s still marked as backordered so I don’t know if Thor found a copy somewhere to just get my ancient order off his books. In any case, thanks GameSurplus! 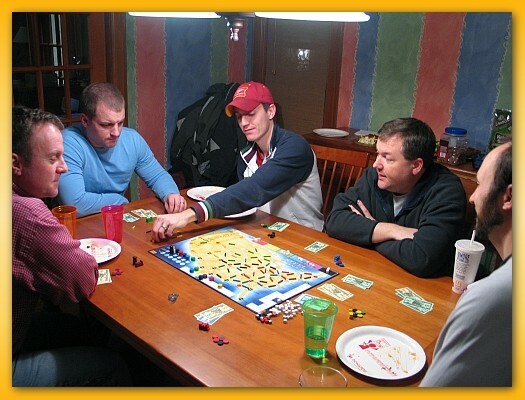 We gathered at my house on a rainy & cold night for the Dec installment of Analog Game Night. We had six (Jared, Tim, Rich, Jason, Bob, & me) so after discussing my few six player games that don’t bog down to a crawl with that number we pulled out Steel Driver. Many of us had just played it a couple of weeks ago so it was kind of nice to play the same game relatively back to back. I know, I know, playing a game two or three weeks apart hardly constitutes “back to back” to many of you but I takes whats I can gets. All In BiddingWith six players, each round grants you six cubes with which to bid. And with six cubes, many players were just bidding six to shut out most players (excepting those that held back a cube or two from the previous round which was rare once the “all in” style of bidding kicked in). So the auction phase turned into less of an auction and more of an, “I’ll take the red train with six” phase. Paper MoneyI hate paper money and the denominations are just downright odd. No $100 bill but a $250 bill?! Cube GrabThe end game cube grab just seems like such an odd ending to an otherwise tactical/strategic game. Similar to Fjords, players take turns grabbing a cube of their choice usually grabbing the highly contested cubes to help round out their set leaving the uncontested or lowly contested cubes to later in the round. This phase sort of plays itself yet sets the value of the shares. It just feels odd that such a quickly played and somewhat automatic/mechanical aspect of the game determines share price. 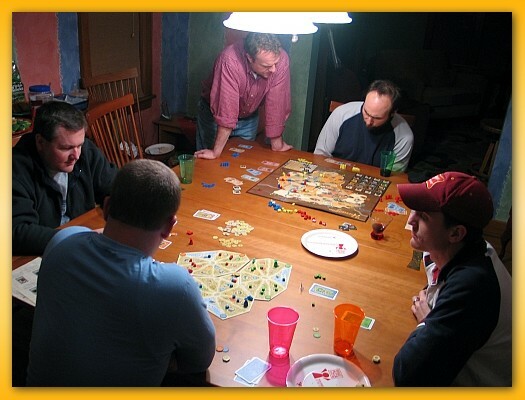 Without another good six player game, we broke into two groups, opened the table and played games at each end. At the near end (in the photo above), Jason, Rich, and Jared relearned and played Notre Dame. Part of me wanted to play that since it’s been a long time since that’s seen the table. At the far end, Tim, Bob, and I learned and played Hermagor. The size of the table is fantastic for playing two game but I must say, it’s a pain to teach two games in such close proximity. I’d never played Hermagor and wasn’t really prepared to teach it to the degree I like. During my flailing, Jason and Rich were rereading rules and at times it felt like we were talking over one another. A little bit like two guys in an emergency ward moaning at ever increasing levels to get the most attention from the doctors. Hermagor is an odd game. I think I like it; either that or I hate it. I can’t tell yet. It has three distinct clumps of mechanics (i.e. production market, travel, stock market) that almost seem like the core of other games glued together thinly with a hint of theme. In the production clump, tiles are drawn randomly from a bag and placed in the “market” area of the board. Then players, take turns paying to place workers in the hallways between stalls and on the stalls themselves trying to exert dominance over the production goods they need. This little area control game grants players production goods and cash depending on placement of workers. Some production goods also allow players to adjust the value of the good in the stock market. After playing out the first clump of mechanics, players take turns trying to traverse the villages on the map in an efficient manner selling goods to villages (and placing a little house). When you sell a good, you get cash in the amount depicted by that good in the stock market. Villages advertise certain goods and you must possess a production good of the appropriate type (from the “market”) to sell a good of that type and you can only sell a good to a specific village once in the game. It costs money to move your little pawn from one village to the next giving this phase of the game a sort of Maharaja meets Thurn & Taxis meets Elfenland feel to it. Once you’ve covered all of the villages that surround little regions on the board you get to place discs in the stock market somewhat like buying a share in the good…an end game tactic. Throw in some oddball mechanics that determine the number of “houses” you can build each round, the randomness of the tiles in the production market, getting stuck with bad tiles, completing a region affording you no place to put a disc in the stock market, and goofy end game bonuses concerning where you’d built your houses (on the main road and in three regions segregated by the river) and you’ve got either a complex game that will be a joy to play multiple times and figure out or you’ve got a mishmash of weird mechanics that have no relationship to one another and it’s hopeless to try to figure out how to manipulate them to your advantage. I don’t know yet and only time will tell. I just hope I can play it back to back in the next year or so. Thanks for coming everyone and see you next month…unless of course someone wants to organize an impromptu get together sooner.